Every class will have a Class Order Hall Campaign. The Hunter Class Order questline campaign starts by accepting the quest “Rise, Champions”. Gain access to your Artifact weapon trait tree. Complete the quest choosing a leveling area. Obtain 325 Artifact Power (earned enough Artifact Power for your next Artifact trait). An NPC next to the Artifact weapon forge will offer you the quest Rise Champion. This is during Alpha version and I´ve heard that this questline unlocks when hitting max level when it comes out live. As usual, these parts will be updated when more information is out. 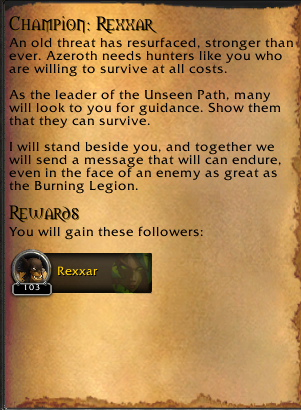 During the Hunter questline campaign, you will eventually get the quest “Recruiting Rexxar”. You have to prove to him that you are a real hunter that can survive the wild. When earning Rexxar´s respect, he will eventually be convinced and joins your order. How to complete the quest "Survive the Night". 1) Gather 3-4 Spinetusk piglets and kill them. Loot the Raw meat. 2) Chop the tree and get wood. 3) Return to the campfire and make a fire. 4) Cook the raw meat. 5) Now the most important: Eat the meat you cooked (hearty Steak). 6) Every time you eat the bar will go up. 7) Keep the bar up until the 2 minutes has passed and you completed the quest.